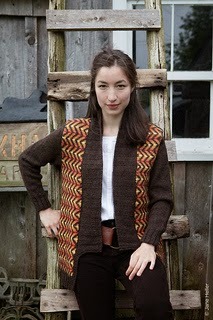 You can find Kourtney here and here on Ravelry. I find inspiration everywhere. It’s hard to avoid; I love colours and textures and how they interact together. Some of my favorite designs have been inspired by mathematical theories, my favorite books, my children, and specific yarns. I keep notebooks with ideas in varying stages in them; some designs come together almost instantly, and some have spent years on and off the drawing board. My favorite knitting technique depends on the day and the project in my hands. I really enjoy stranded colourwork, but I also adore adding beads to knitting. And I like lace. And cables are really cool… but then, garter stitch is so plush and amazing… and… Really, it’s probably shorter to list the knitting techniques I don’t enjoy: I’m not much for entrelac. And I don’t like toe-up socks very much as I have a very high arch. I actually spend a lot of time looking at other’s designs! I don’t think it’s possible to exist in a vacuum, and in all honesty – my knitting and designing time is so limited that before I go about putting an idea into production to become a finished design, I do a pretty thorough hunt to make sure that someone else hasn’t designed it first. If they have, they’ve saved me the trouble! I take a lot of pride in the patterns I publish, and I feel that they all reflect my unique style in one way or another. I don’t think it needs to be a controversy. I try to write very accessible patterns, that are easy for all skill-levels to approach. (As an example, almost all of my patterns with charts offer written instructions as well.) My opinion is that if you are a very accomplished knitter, you can skip over the extra details; if you aren’t, the extra bits of detail are going to increase your pleasure in the project and your overall success. This has changed over the course of my career. I currently work closely with one other knitter – I call her my “tech knitter”; she does sample knitting and tech editing, sort of all rolled up into one. She has a very methodical approach and is quite opinionated, which I delight in! 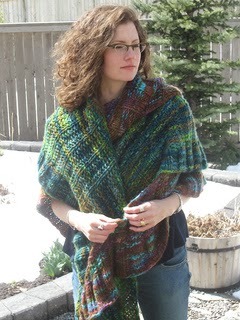 Most projects have been knit several times by me, before I send them to her for another final knit and proofread. I do pay her for the knitting she does, and I provide the yarn and finished pattern, and she gives me the knitted sample. The internet is a big part of why my business has it’s current shapes – without Ravelry, I might not have decided to hurdle the electronic challenges to self-publish online patterns. Ravelry also provides wonderful access to the global knitting community; in the past several months I’ve communicated with knitters in Canada, the USA, New Zealand, South Korea, Russia, the UK, and Germany. Without the internet, I wouldn’t have the chance to share ideas and conversations with all of these people. Yes; all my patterns are tech edited in one way or another. HAHAHAHA - that’s a good question, ha! Short answer: I wish I needed less sleep. Longer answer: as the stay-at-home mom to two small kids, balance is on ongoing challenge. I look at my daughters as my current full-time job, and design work as my part time job. I try to spend as much time as I can on my (part time) design work that feeds my soul, without taking away from my full-time job of raising my daughters (that feeds my heart). It’s tricky, and as any mother will tell you, there are always moments when you worry that you don’t have it right. Of course, almost every knitter I know will say that they wish they had more knitting time, so I’m in good company either way! I listen to it. Sometimes there can be important chances to make positive change in criticism. Of course, this being the age of the internet, I’m aware that there are trolls out there… so I’m prepared to ignore criticism once I listen to it! But I do give it an honest listen, first. Again, with the funny questions! My knitting designs may support my yarn habit but they certainly don’t support me. This is partially because I’m part of a family that has chosen for me to leave the “office” life and raise our children. It can be a thorny question among stay-at-home-parents as to whether or not they are supporting themselves… I’m curious as to how many designers support themselves fully by knitting. It seems to be a bit of a forbidden topic, to discuss earnings and money.